When I taught map reading in the U.S., there was a piece of folklore that we used to tell our students: that the green areas on the USGS topographic map indicated there was a sufficiently dense forest there that you could hide a platoon of soldiers (about 40 people) per acre. It was a good way to explain why small clumps of trees (or “tree islands”) didn’t appear on the map. This story lives on on the Internet, but there’s no evidence that it’s really true. I like the implied subtext — cartographers producing the maps for military officers involved in some kind of domestic war, and needing to know where they could hide their men from aircraft –- but it doesn’t take much reflection to realize that the U.S. Geological Survey never could have visited all those places, looked at the tree cover, and decided where you could or couldn’t hide 40 guys. Or even how to divide it up into suitable one acre blocks. In Canada, the green area on the topographic maps has a specific definition. According to Natural Resources Canada it’s “An area at least 35 per cent covered by perennial vegetation of a minimum height of 2 m.” And they probably estimate that 35% coverage from air photos. The term treeline designates the upper limit of the occurrence of tree species, regardless of their stature, whereas timberline refers to the upper limit of forest, of continuous cover of upright trees 3 m or more in height. So timberline, being where the solid forest ends, is the end of green on our classic NRCan topos. Treeline is the last little, twisted, stunted tree. Neither, of course, is really a line. As map scale decreases and you zoom in, the timberline becomes impossibly complex, and has to be generalized somehow. And no map, I think it’s fair to say, tries to represent treeline, since this would somehow be defined by many isolated clumps of krummholtz (“twisted-wood”, the bonzai-like tree clumps also known affectionately as shintangle) that you see after ascending past timberline. And just to make things a bit more complicated, as the climate changes it has become easy (in northern BC at least) to find areas above treeline where dozens of tiny seedlings are coming up and now surviving. How big would they have to be before one moves treeline? Timberline however is a very important landmark for hikers and skiers, and how to represent it is a question that comes up frequently in topographic mapping. Of course using using generalized green and white is not the only option. I first learned this when I was bushwhacking across a 1:50,000 scale “provisional” series, black-and-white topographic map in northern BC. On these there is actually a black line that snakes across the elevation contours. It has “W” on one side of it (for wooded) and “C” on the other (for clear). Little pairs of tick marks pointed into the forested side. It was hard enough to read that I took a pencil crayon and shaded in some green on the W side. There’s also the solution that National Geographic used years ago in mapping northern Canada; the Northern Limit of Wooded Country is represented by a line of tiny tree symbols. Sometimes using green is just out of the question. If you want to use a range of colours to represent elevation (hyposgraphic tinting), having green forest is going to be quite confusing. In these cases I have I tried a technique of having a dashed green line at timberline, bordered by some fill on the downhill side, fill that quickly fades out. You can do this in QGIS by using shapeburst fill, shading to a set distance of a few millimetres. I have also played around with not marking timberline at all, and just putting a note beside the trail at the point when one would clear the trees. Another option available to you if you have access to landcover data, is to give map-readers more information about how the forest makes that complicated transition to grassy tundra. In this case I used the Land Cover, circa 2000-Vector data available at Geogratis, and assigned progressively lighter colours to “coniferous dense” (which captures the main forest of spruce and fir), “coniferous open” and “broadleaf open” (which captures willow). If timberline is something you just want to suggest, but don’t really need to accurately show, a method that can still look good is to style the digital elevation model in a series of fading greens. Have it become completely white at the elevation where timberline is typically encountered in the area. You get the effect of the “naked” mountains rising above forested slopes without introducing the complexity of avalanche tracks and the differences in where trees grow between north- and south-facing slopes. Sometimes the highest elevations on the map just touch timberline, in which case there can be a large zone where small meadows alternate with clumps of diminutive trees, an ecology often called parkland. I’ve tried representing this by scattering a host of little tree shapes, sort of trying to show how trees are still there, but not connected to the “mainland” of the forest. And this is just scratching the surface. The more you study timberline, the more you realize the folly of trying to show it accurately, yet the importance of indicating where we see it! 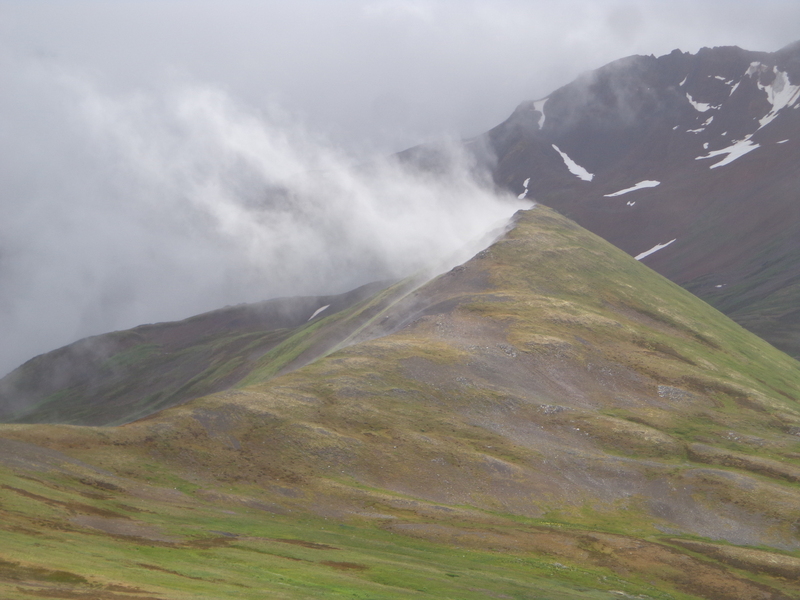 Unnamed ridge of Kispiox Mtn. 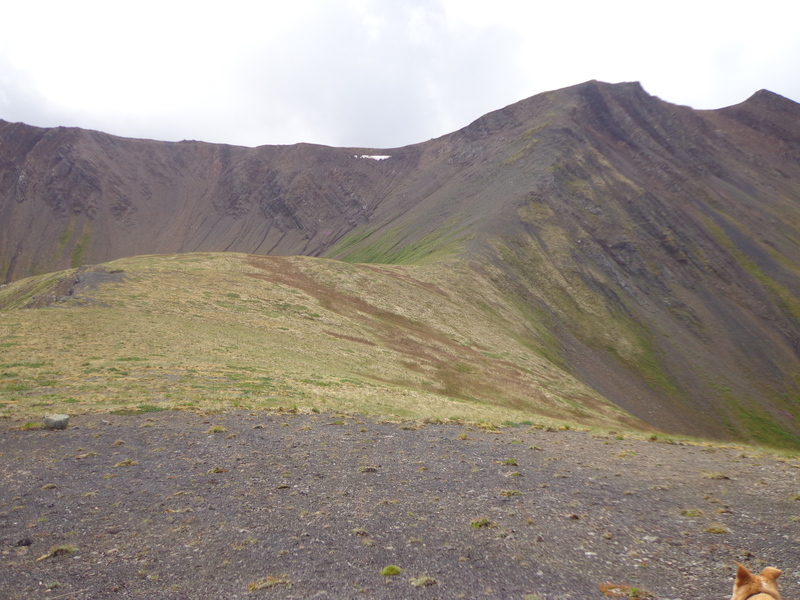 Yesterday I went up to Kispiox and hiked the Moonlight Mountain trail. I’m not sure the folks who showed me this trail would like its location publicized yet, so I won’t disclose precisely where it is, but it approaches Kispiox Mountain from the north. The name “Moonlight” is a bit of a mystery, since there is no gazetted Moonlight Mountain, nor is there a Moonlight Creek, or any other “Moonlight” feature in the area. My theory is that it is a corruption of Moonlit Creek, which runs west from here into the Kitwanga River near Kitwancool Lake. As the photo below shows, the rock here is composed of tilted – seriously tilted – strata. They vary from grey to deep black. So black, in fact, that I thought of oil, and then it occurred to me that these might be Bowser Basin sediments. North Ridge of Moonlight — zoom in to see the tilted strata. Bowser Basin sediments, for those of you who don’t live in northern BC, are the infamous rock unit that hosts quite a bit of coal, gas and oil — various kinds of hydrocarbons — and are responsible for much of the unwelcome interest that oil and coal companies have in northwest BC. These beds are so beautifully up-ended and even perhaps overturned: you can see BC’s tectonic assemblage process in action.